This week, we have middle-grade novelist Danette Haworth who grew up in an Air Force family–a lifestyle that allowed her to visit castles, deserts, and a bunch of states along the East Coast. Before going freelance, she worked as a technical writer and a travel writer. She always stayed up too late reading. One day, an idea grabbed her and didn’t let go. Now she stays up too late writing! 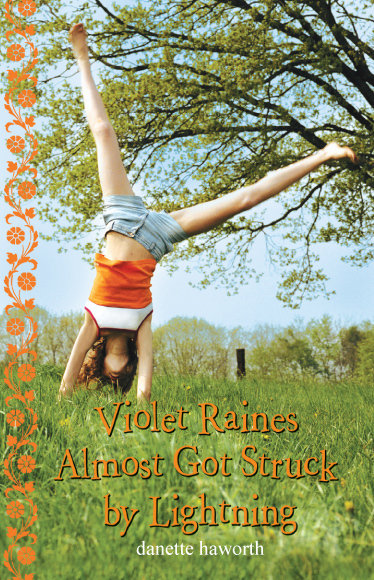 First, here’s a little bit about the Danette’s book VIOLET RAINES ALMOST GOT STRUCK BY LIGHTNING (Walker & Company). Spunky, headstrong Violet Raines is happy with things just the way they are in her sleepy backwoods Florida town. She loves going to the fish fry with her best friend, Lottie, and collecting BrainFreeze cups with her good friend Eddie. She loves squeezing into the open trunk of the old cypress tree, looking for alligators in the river, and witnessing lighting storms on a warm summer day. But Violet’s world is turned upside down when Melissa moves to town from big city Detroit. All of a sudden Violet’s supposed to want to wear makeup, and watch soap operas, and play Truth or Dare! It’ll take the help of Violet’s friends, her Momma, a few run-ins with lightning, and maybe even Melissa, for Violet to realize that growing up doesn’t have to mean changing who you are. Now let’s start the interview. Danette, what happened when you received your offer? After I received the offer, I was drained! It had been an incredible day, starting with my phone going down, my email server suddenly becoming unreliable, and my cell phone shutting off after several hours of talking with my agent. So now that you have a contract, what’s it like to be on the other side–on the verge of publication? What does it feel like to be official? I don’t think I will feel official until I see Violet Raines on bookshelves. Until then, I feel like I’m sitting on top of this marvelous secret. Tell us a little bit about your path to publication. Even that wasn’t enough. I wanted to write a book. I started reading books on the craft of writing, researching writing websites, and connecting to other writers. In the summer of 2007, I attended an SCBWI workshop after having submitted my first ten pages for critique. What luck! An editor was assigned to my critique and she loved my work. One revision and four months later, I had an offer. And here’s our favorite question. How many rejections did you receive IN GENERAL (not just for these books) before you landed your first major publishing contract? I didn’t keep track because it was too depressing. I didn’t keep track because I am not that organized. They don’t make a number that big. Tell us about some of your most heart-breaking rejections and some of your best. The most heart-breaking rejection I ever received was for the first piece I ever submitted. A magazine editor called me after reading my submission–he loved it! He already had in mind a two-page spread and which month it would be published in, and he asked about my other work. A few weeks later, I received–instead of a contract–a letter explaining why the magazine could not use my work. That was a discouraging first taste of the industry! As far as good rejections go, I’ve received words of praise scribbled on forms or personal notes. The best rejection came from another magazine editor whose team didn’t feel my short story was right for their magazine, but the editor noted that he personally enjoyed it. It made me want to write stories just for him. Keeping the USPS in business with my many submissions was my job. I’ve got the best job because I get to do what I love doing. What are some of the new things you worry about now that you have a contract? The new things I worry about are the same as the old things I worried about: Will people like my book? How will my next story go over? Will anyone discover my secret hiding place for donuts? If you’ve already begun or have finished the editorial process, tell us what that’s been like. After signing my contract, I received a line-edit and an editorial letter from my editor. I couldn’t believe how spot-on her suggestions were! Her line comments helped me crank up the volume on certain passages. The editorial letter was two pages and covered issues we’d already discussed. In the six weeks I had to complete the revision, my editor was always available and extremely responsive whenever I had questions. It was altogether an excellent experience. Describe an Ah-ha moment you might have had that influenced your writing in a positive way. One day, I came across the quote “Writers write.” This simple but profound quote caused a change in my approach to writing. If I was to be a writer, I couldn’t just sit around thinking about writing; I couldn’t jot down a few buzz words and expect the story to come to me. I had to actually write. I realized that I could practice writing and get better at it, as it is with all things you practice. Writing has become a daily discipline for me, and I cherish that time. Aside from WRITING FOR CHILDREN AND TEENS: A CRASH COURSE (shameless plug! ), what other writing books would you recommend? I like Beginnings, Middles & Ends by Nancy Kress, and Writing the Breakout Novel by Donald Maass. Finally, one last question. Got any advice for aspiring authors? My advice to aspiring authors is to expose your work. You must get qualified feedback if you wish to improve. Post to boards, join a critique group, pay for a critique, but get that feedback–it’s crucial. You can’t be sure where your strengths and weaknesses lie without it. This concludes our interview with the dazzling Danette Haworth. We wish her oodles of sales for VIOLET RAINES, and Snoop is sending her a truckload of donuts–if she tells us where she hides them! Also if you’d like to learn more about Danette, do visit her website at http://www.DanetteHaworth.com and her blog at http://summerfriend.blogspot.com. Tune in next week to learn about our next Author on the Verge, fantasy author Chris Rettstatt! If YOU are a debut children’s book author with a major trade publisher and would like to be featured on AOTV, please contact me. This entry was posted in Authors on the Verge. Bookmark the permalink. I’m glad you enjoyed the interview! Thanks so much for the feedback. Snoop and I are so pleased. Look forward to weeks and weeks of interviews with today’s latest authors! Another great interview Cynthea. I really love reading these – very insightful to see another authors journey boiled down to a few key points! Thanks for the comments. Snoop and I are thrilled you find them insightful! We think they’re pretty cool, too. Great interview! I can’t wait until this book comes out. Wahoo!! Hey Lisa! Glad you enjoyed it! Such fun insider stuff about Danette! And Snoop, hang in there. Your day will come. Thanks, Nancy. Snoop says – my day has already come. Don’t you know I’m the coolest bunny on the Internet? I’ve just finished “Violet Raines Almost Got Struck by Lightning” and would like to know if she’s going to write a sequel. I’d love a sequel, I’d buy as soon as it came out. Thanks for asking about a sequel to Violet Raines. The answer to your question is I don’t know! I don’t know if I’ll write a sequel but I can tell you I think of Violet every day, so who knows? In the meantime, I’m hard at work on my next book, The Hotel of Blueberry Goodness. I hope you’ll check it out!